Here at Lake Montessori, we value every stage of your child’s educational development. We hit the ground running with valuable, hands-on, learning at Pre-K, we immerse your elementary-aged student in in-depth educational methods, we challenge your middle schooler with lessons in critical thinking, and we instill in your high schooler the tools, habits, and thought processes they’ll find crucial when they make their transition into college. At Lake Montessori, your high schooler will be physically, mentally, and emotionally prepared for their forthcoming jump into the real world. It is our goal that no Leesburg Montessori high schooler enters college with the “deer in the headlights” experience that so many young people seem to encounter. Too often, in standard high schools, students are not introduced to a fair, healthy, or realistic enough approach to learning, and with that disconnect comes an inability to function well in college. In addition to the way that a student is taught, if study habits, reasoning skills, critical thinking methods, and other vital qualities are not reinforced in the high school years, college is often a bit of a mess. Lake Montessori desires to change the game when it comes to college readiness. By setting high expectations in high school, we’ve found that many students thrive and even excel. Because a number of high school students across the nation feel that they are normally written off, underestimated, and undervalued, many of these misunderstood young people rise to the low expectations that they feel is set for them. At Leesburg’s Lake Montessori, things are different. Through encouragement, an emphasis on self-motivation, and great accountability, we expect a great deal from our high schoolers and we believe that this expectation is part of the reason our kids have seen so much success in college. 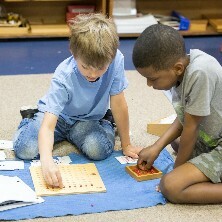 Montessori kids are capable, hard-working, and set-disciplined. Contact Lake Montessori today to discuss our high school program! Is Lake Montessori Highschool program accredited? Lake Montessori is partnering with FLVS in providing the best of both worlds, we are a small private school which features face to face classroom instruction as well as an online support system component backed by an FLVS’s online courses accredited by Advance Education, Inc. (AdvancED). The various FLVS schools are accredited by SACS CASI (Southern Association of College and Schools Council on Accreditation and School Improvement). The courses meet all of the Florida Standards. What type of Diploma do they receive? Future Lake Montessori graduates will receive a school diploma. Transcripts, report cards, and diplomas are issued by Lake Montessori school in accordance with its procedures and policies. Why Lake Montessori High school? In a small student-teacher setting, students will have hands-on-lessons as well as the ability to choose from more than 150 online courses. Lake Montessori teachers model holistic values and devote their attention to set up the students for success. Along with a certified counselor, Lake Montessori students will have all the benefits of a big traditional school in a small school setting. Learn More About VPK Today! Do not fill this form out if you're a solicitor.your information will not be shared or sold in any way. Our Lake Montessori programs are tailored for children from 2 1/2 years to 6+ years of age and include early education and before and after school programs to meet you and your child's needs. 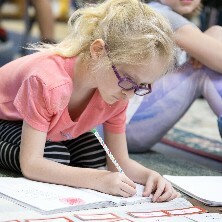 Using the Montessori methods, a carefully prepared environment and the best teachers to help students develop positive attitudes and create successful learners, responsible individuals, and effective citizens. Our Camp Montessori programs include a variety of 8 different themes to keep your child busy learning and having fun all summer long. Pick one camp, or all 8 to keep your little one busy this summer! Lake Montessori is the only Montessori school in Leesburg, Florida, using over 100 years of proven success to educate your children. If you are interested in any of our programs please contact us today! ©2017 Lake Montessori - Do not copy. All rights reserved.